Art by various artists part of the exhibit. 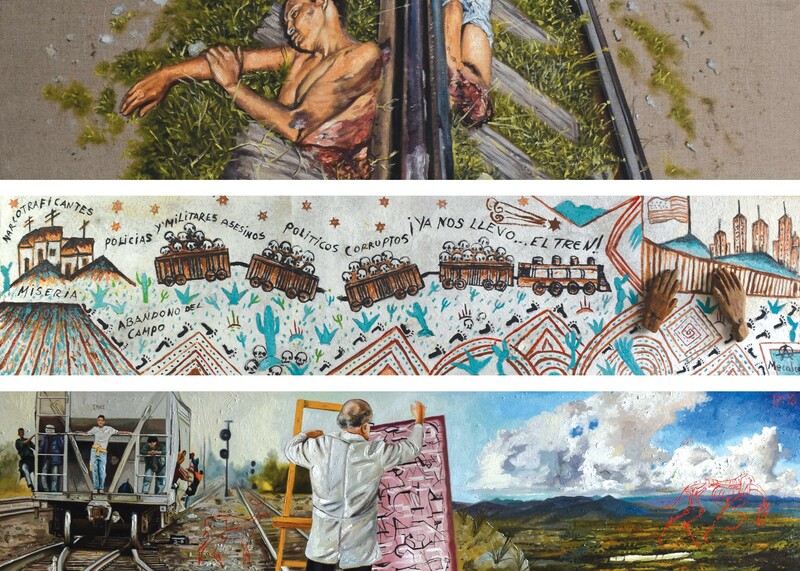 The MONTARlaBestia exhibit by Colectivo de Artistas Contra la Discriminación (Artist Collective Against Discrimination) is now on display at the Center for Latin American Studies at UC Berkeley. “La Bestia” is the train that carries up to half a million migrants every year along the treacherous route from Central America to the Mexican border with the United States. While the talk of a border wall, the deportation of undocumented immigrants, and of minors who fled poverty has been at the center of national and international news, this exhibit reminds us to humanize this controversial topic. Through art and poetry, the stunning exhibit hopes to explore what it means to ride “La Bestia” and the stories of those who choose this dangerous path of coming to the United States. This exhibit is the creation of Mexican artists Demián Flores and Marco Barrera Bassols, and it is part of a larger project exploring the dynamics between Mexico and the United States coming to UC Berkeley this fall.